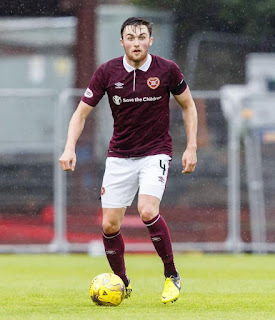 Rangers fans a little wary of the links with Hearts’ John Souttar may find themselves paying significant attention to the 22-year old defender’s performance this Saturday, as Steven Gerrard takes his men for the second meeting with Hearts in only a few weeks. Naturally, the performance at Ibrox on the 2nd saw a comfortable home win as Gerrard’s men arrested March’s horrific form with one of the season’s better displays, and with the split upon us, Rangers supporters will keenly watch Souttar to see how he does under the spotlight of real pressure. We’ve been here before with Hearts – Rangers heavily involved with transfer deals with the likes of Jamie Walker and Kyle Lafferty in recent times, and their performances against us would be under the spotlight more than usual. Walker capitulated and Lafferty was quiet. And now it’s Souttar’s turn to face the music – with Gerrard’s reported interest in him, Saturday is his chance to shine, and is an effective first audition. If his season’s displays have alerted the Rangers manager to his possible services, Saturday will be the first time he’s had some pressure on him in this manner, and it’s his chance to shine. You can’t be better scouted than by the opposition (and potential future) manager watching you from the sidelines. Joe Worrall will return to Forest and Gareth McAuley’s contract won’t be renewed, meaning there will be two new vacancies in defence, and Souttar is the first name apparently being actively sounded out. He also has the small matter of the cup final – a real pressure audition should he do well in the split – a chance at silverware at Hampden against Celtic. Should Souttar excel in that one, he may find Ibrox doors opening to him. Ibrox Noise, do you want Rangers to win the league? !, this may seem a silly question, however, mediocre players such as Souttar will not add to the required quality to beat Celtic to the league! We had a long standing arguement about Jamie Walker when you over marketed the guys ability just because he was a Rangers man, well?,so much so, you stopped publishing my comments because I disagreed with you on Walker,,, where is he today?! He was farmed out on loan to league ones Peterbourgh!! Enough said!! Now you seem to be dong the same with Hearts Souttar,,, he is no where near the quality Rangers need to win the league,,, just like Jamie Walker!! I'm not convinced Gerrard is the man either,, but if keeps bringing in average/mediocre players, then we need to get rid of him now!!! Bit unfair Jim, all we’ve said is he’s struggled v top 6 opponents and now has a chance to prove us wrong. We’ve far from called Souttar the next Cuellar.